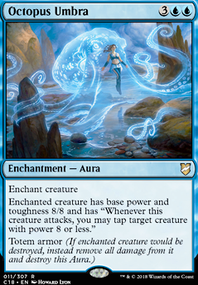 Hi, I think aura cards are not very good in EDH unless you went full in the aura strategie. 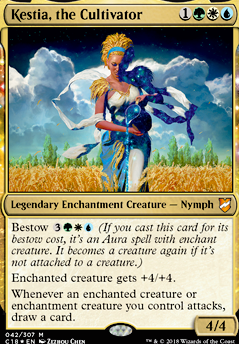 If you want to get the auras going there are much better commanders then Trostani for example Kestia, the Cultivator or Bruna, Light of Alabaster . 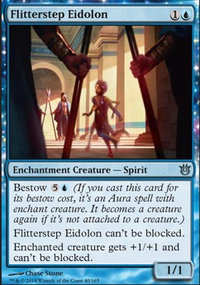 If you just want to buff your little guys I would recommend effects like Beastmaster Ascension which buff your whole team. 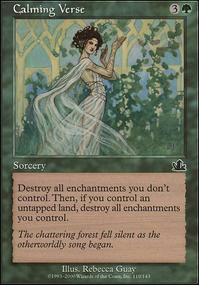 There are a lot of anthem enchantments you could play. 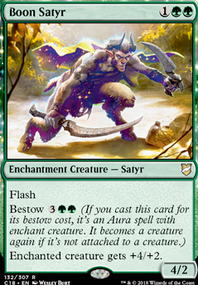 If you still want to play some aura cards I would recommend to go with cards with the ability bestow or totem armour. 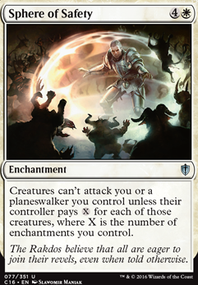 With these abilities your creatures are protected from destroy effects so your opponents will not get 2 for 1 if they destroy your enchantet creature. 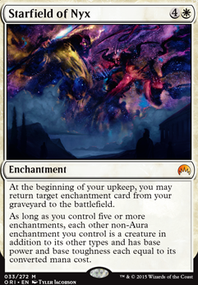 Examples: Celestial Archon , Bear Umbra . 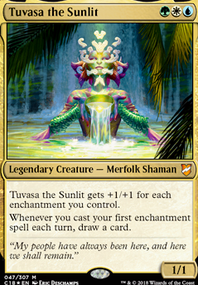 This year (With Commander 2018) you've gotten to solid options for an commander Tuvasa the Sunlit and Kestia, the Cultivator both with an enchantment oriented draw engine. Let me start off by saying I've played around 10 games with the deck straight out of the box. So I received the Adaptive Enchantments precon from my parents, and I'm sad to say I dislike the general enchantress style, I even got a good engine going with Kestia, the Cultivator and a few enchantment creatures, but it seems kinda straightforward and boring; just playing enchantresses and drawing cards while kinda pillowforting up. 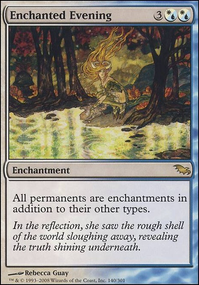 I know it might not be me giving the deck too much of a chance, but I think that enchantress isn't for me. That being said, I do want a new deck. 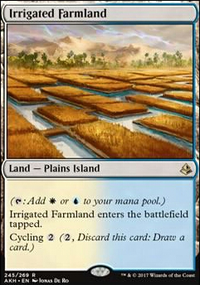 Are there any cards in the Precon that would be good to build around? Legendary or not? I don't want to waste it, since I really appreciate my parents getting it for me without me even asking, but like I said it's not my style. I'm more of an aggressive//ramp guy that likes all the colors evenly. 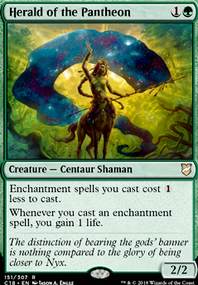 I play in a %75 meta, and would love to figure out a new deck that isn't temur or bantchanments, but would love to see if I can turn the enchantress precon into something I'd love to play. 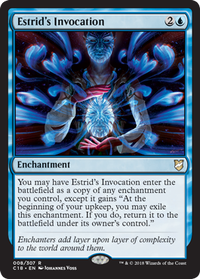 After purchasing the Adaptive Enchantment deck, I'm finding myself having a lot of fun playing around with it. 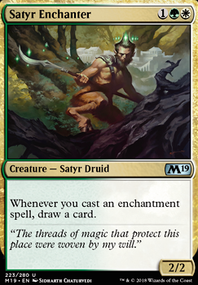 All 3 commanders for it seem very fun and unique, I just can't decide, as I look to buy some singles for it, which I should build around. 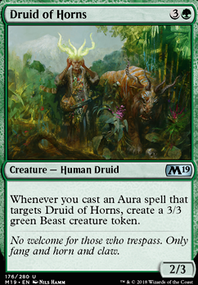 My playgroup is more %75 than anything, and I love having fun unique decklists, but nothing TOO voltrony, although I do love auras, and going tall and sorta wide interests me.